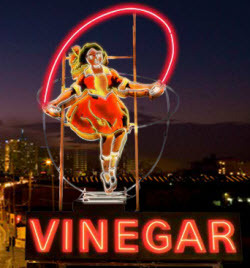 One of Melbourne's most well known and loved icons, 'Little Audrey' the Skipping Girl Vinegar sign is skipping again after being restored in 2009 to its former shining glory. The animated neon sign, which is instantly recognisable as part of Melbourne's landscape and history, was nicknamed 'Little Audrey' in the 1930s when the animated sign depicting a young girl playing jump-rope captured the eyes and hearts of all of Melbourne. The playful image quickly became a cultural icon of Melbourne that has endured since then, featuring in work that has spanned many genres including songs, photography and painting. Officially declared a Victorian Heritage Icon by the National Trust in 2007, the Skipping Girl Sign is also included on the Victorian Heritage Register which lists the most significant places and objects. From Thursday 16th November 2012, Little Audrey will skip 16,000 times every night powered by solar.. power built up during the day by sunlight. Now in her 75th year Audrey's getting another gift - solar power, so she can continue to skip and light up Melbourne's skyline. 'Skipping Girl' brand vinegar introduced around the beginning of the 20th century - the bottle label featured a sketch of a young girl skipping rope. One report says that she was local girl Alma Burns. Another report says that that her identity was a mystery for many years because she later became a nun. It was claimed in 1990 that Sister Felicitas Monague, who died aged 76 in 1984 and had served in the Brigidine Convent near Frankston for 53 years was the model, based on a sketch that her brother James sent in that won a competition for the logo. In mid 1930s the 'Skipping Girl' became known as 'little Audrey'. By the 1930s, the vinegar was being produced in a factory on Victoria Street, Richmond, the building and the brand owned by Nycander & Co. The sign was erected in 1936 by neon Electric Signs, later Whiteway, who actually owned it, and rented it to Nycander & Co. for 8 pounds, 15 shilling / month. It was an early example of an animated neon sign, and remained by far the most prominent and popular animated neon sign for many years. It is reported that the model for the sign was different to that of the label. It was said that the manager of the factory based the sign on a photograph he took of a young girl named Elma, the daughter of the owner of the nearby milk bar where he bought his cigarettes. In the late 1960s the factory moved to Altona, and the site was sold to the Fire Brigade to build a training facility, and the building was to be demolished by Whelan the Wrecker in August 1968. Neon Electric hoped to retain the sign, but Whelan's claimed ownership, removed the sign, and reportedly sold it to a used car dealer, CE Haywwood P/L, Panel beaters in Abbotsford, who had purchased it for $100. Barry Humphries found the remains in May 1974, laid a wraith, and sang a specially composed song for the event. (Age, 8 April 1990). The loss of the sign, and dispute over ownership, caused great media interest, with many calls for it to be saved and re-erected. One radio station established a 'save little Audrey' campaign. John (also known as Jack) Benjamin, Governing Director of Crusader Plate (an electroplating works), located in a 1930s factory just 200m down the road, 'came to the rescue', and allowed the use of their rooftop for a token rental, and a new sign was constructed, smaller than the original, and a different, more flowing design, which was relit at a ceremony on Friday, 13 November 1970. The Plating factory closed, and the building was then sold in 1989, and redeveloped as offices. The development was named 'Skipping Girl Place', and the sign restored, and ceremoniously relit after 4 years of darkness on 23 May 1990.